If you have publications related to FRANC3D that are not listed here, please send us the reference. Proceedings of the ASME Turbo Expo 2019: Turbomachinery Technical Conference and Exposition GT2019 June 11-15, 2019, Oslo, Norway. Bhachu, K.S., Narasimhachary, S.B., Shinde, S.R., Gravett, P.W. (2017) Application of 3D Fracture Mechanics for Improved Crack Growth Predictions of Gas Turbine Components. ASME Turbo Expo 2017: Turbomachinery Technical Conference and Exposition Volume 7A: Structures and Dynamics. Charlotte, NC. Fernandes, R., El-Borgi, S., Ahmed, K., Friswell, M.I. Jamia, N. (2016) Static fracture and modal analysis simulation of a gas turbine compressor blade and bladed disk system. Advanced Modeling and Simulation in Engineering Sciences,3:30. McClung,R.C., Wawrzynek,P., Lee, Y., Carter, B.J., Moody, J.P., Enright, M.P. (2016) An Integrated Software Tool for High Fidelity Probabilistic Assessments of Metallic Aero-Engine Components. Proceedings of ASME Turbo Expo 2016: Turbomachinery Technical Conference and Exposition GT2016, Seoul, South Korea. Ewest, D., Almroth, P., Sjödin, B., Simonsson, K., Leidermark, D., Moverare, J. (2016) A modified compliance method for fatigue crack propagation applied on a single edge notch specimen. International Journal of Fatigue, 92, 61-70. Storgärds, E., Simonsson, K., Sjöström, S. (2016) Three-dimensional crack growth modelling of a Ni-based superalloy at elevated temperature and sustained loading. Theoretical and Applied Fracture Mechanics, 81, 2-10. Garcia, I.G., Carter, B.J., Ingraffea, A.R., and Mantic, V. (2016) A numerical study of transverse cracking in cross-ply laminates by 3D finite fracture mechanics. Composites Part B 95, 475-487. Rao, V.N. and Eischen, J.W. (2016) Failure analysis of mixed mode crack growth in heavy duty truck frame rail. Case Studies in Engineering Failure Analysis, 5-6, 67-74. Davis, B.R., Wawrzynek, P.A., Carter, B.J., Ingraffea A.R. (2016) 3-D simulation of arbitrary crack growth using an energy-based formulation - Part II: Non-planar growth. Engineering Fracture Mechanics, 154, 111-127. 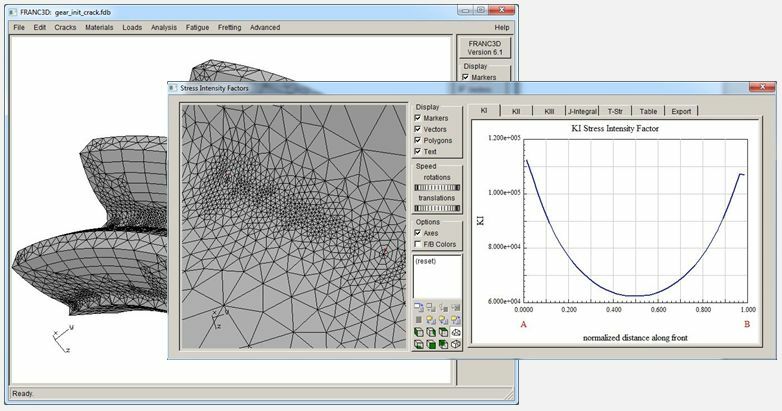 Busse, C. (2014) Accounting for non-linear effects in fatigue crack propagation simulations using FRANC3D. Master Thesis, Mech Eng, Linköping University. Pettit, R., Annigeri, B., Owen, W, Wawrzynek, P. (2013) Next generation 3D mixed mode fracture propagation theory including HCF-LCF interaction. Engineering Fracture Mechanics 102, 1-14. Carter, B.J., Schenck, E.C., Wawrzynek, P.A., Ingraffea, A.R., and Barlow, K.W. (2012) Three-dimensional Simulation of Fretting Crack Nucleation and Growth. Engineering Fracture Mechanics, 96, 447-460. Wawrzynek, P.A., Carter, B.J., and Ingraffea, A.R., (2009) Advances in Simulation of Arbitrary 3D Crack Growth using FRANC3D/NG. Proceedings of ICF12, Ottawa. Banks-Sills, L., Wawrzynek, P.A., Carter, B.J., Ingraffea, A.R. and Hershkovitz, I. (2007) Methods for calculating stress intensity factors in anisotropic materials: Part II-Arbitrary geometry. Engineering Fracture Mechanics, Vol 74, No 8, pp 1293-1307.